Among the most interesting things you might happen to do at Farnborough International Airshow, there’s a ride in a combat plane simulator. 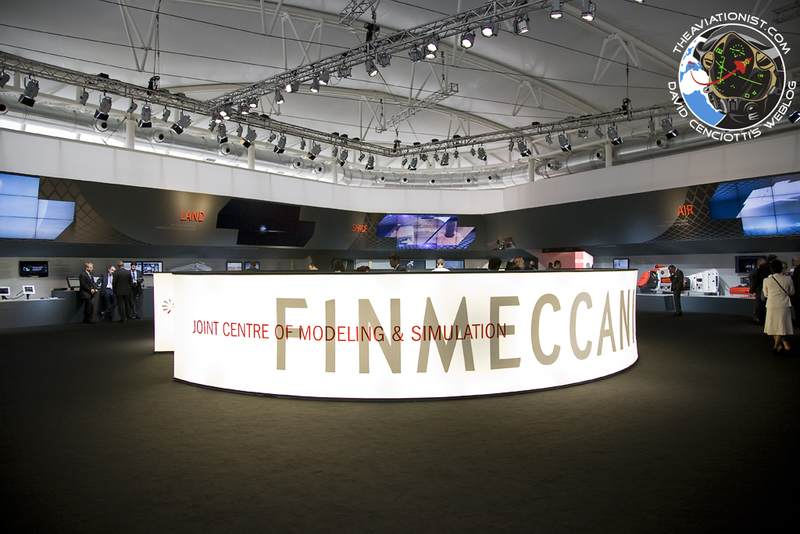 During the Day 2 of FIA12 (#FIA12 or #FARN12 for the Tweeps), I had the opportunity to try the Alenia Aermacchi M-346 simulator, one of the two hosted inside the large Finmeccanica Pavilion. 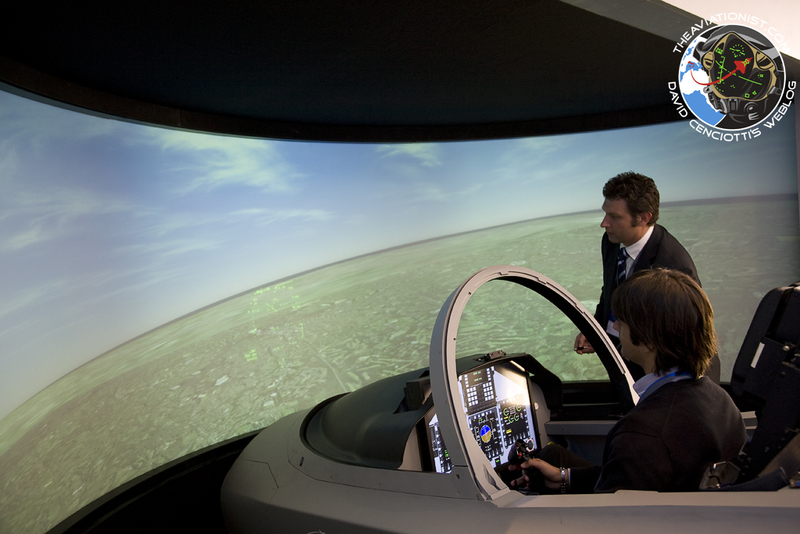 Although simplified a little bit in terms of consoles and instruments, the Master’s simulator is absolutely realistic in terms of flight model and mission systems thus giving the “pilot” (a journalist in this case…) the opportunity to test the aircraft’s handling capabilities, performances and systems. 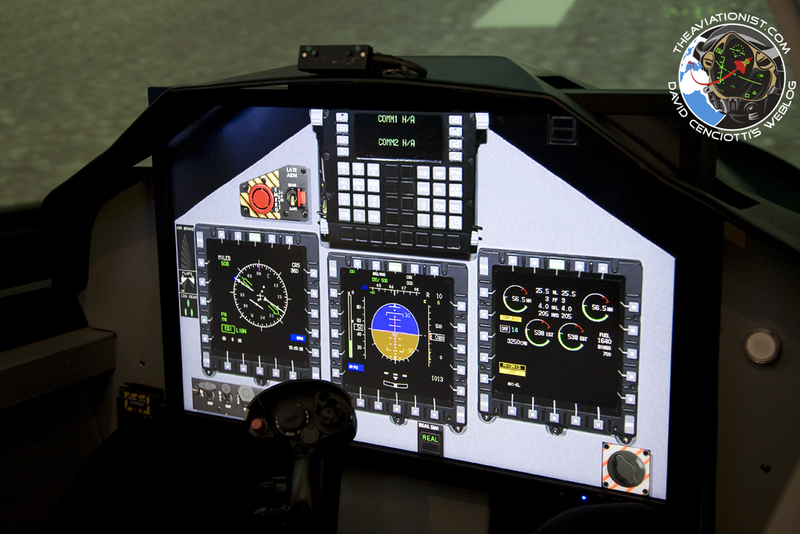 The simulator runs the OFP7 software release, the one currently installed on the six Italian Air Force M-346s. The demo started on Farnborough runway, with the aircraft lined up and ready for take off, after a very detailed briefing by Gabriele Sgarbi, an engineer at Alenia Aermacchi’s Integrated Training System department. 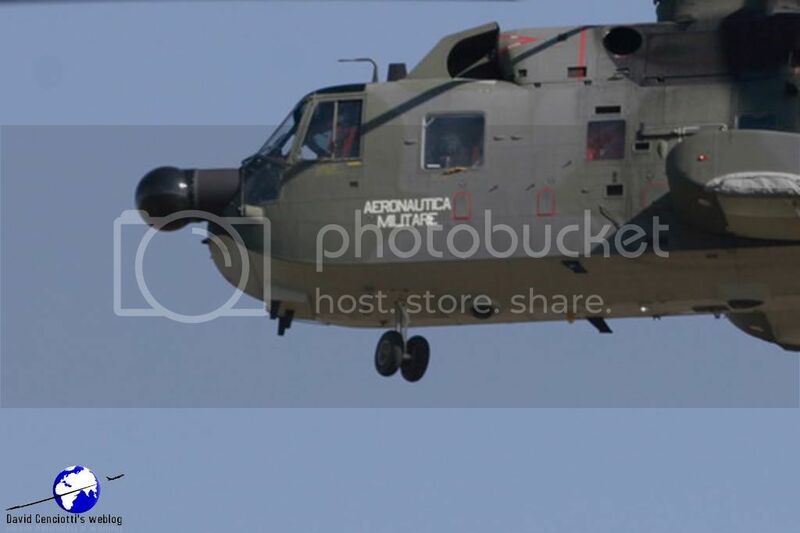 I slammed the throttle to the maximum thrust to begin the take off roll. The aircraft accelerated quickly and I had only to use a bit of rudder to keep the nose aligned with the runway centerline. At 100 knots I pulled the stick for a steep climb. The aircraft continued to accelerate and I had to be quite fast to retract the landing gear and the flaps. General handling of the jet is quite easy and you can find all the information you need on the three large MFD (Multi-Function Displays) that showed the Flight Director, the ADI and engine parameters. Obviously, the Head Up Display provides all the required data through the typical HUD symbology. After a couple of turns I used to get used with the HOTAS (Hands On Throttle And Stick) cockpit, at an altitude of 3,000 feet and just above 300 knots, I started a looping that I ended at the same altitude, after pulling 4.5 Gs. After few more aerobatics, Gabriele suggested me to set the throttle to Idle and keep the nose high to see how the aircraft handles at High AOA (Angle Of Attack). Once again, the M-346 behaved just like the most modern combat planes, reaching 25° AOA and keeping a significant flight controls’ authority. After flying around Farnborough for a few more minutes I headed back to the airport for a touch and go. I throttled back to Idle and extracted the air brakes using one of the switches on the throttle. As I reached 250 knots, I extended the landing gear and as the air speed went below 240 I selected the Take Off flaps. I selected full flaps on the downwind leg, flew the final approach at 130 knots and, with a gentle flare, I touched the runway. As soon as the nose gear went down, I once again throttled to the maximum thrust and took the air again, for the second part of the demo. 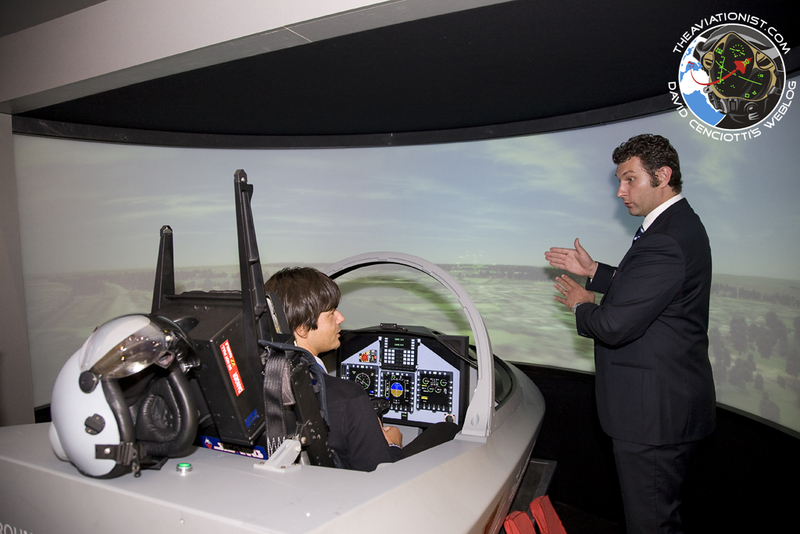 Gabriele showed me [at the simulator what can be actually done on the real M-346]: the aircraft can be quickly reconfigured to simulate different payload configurations, both air-to-air and air-to-ground, to be used to train student pilots. 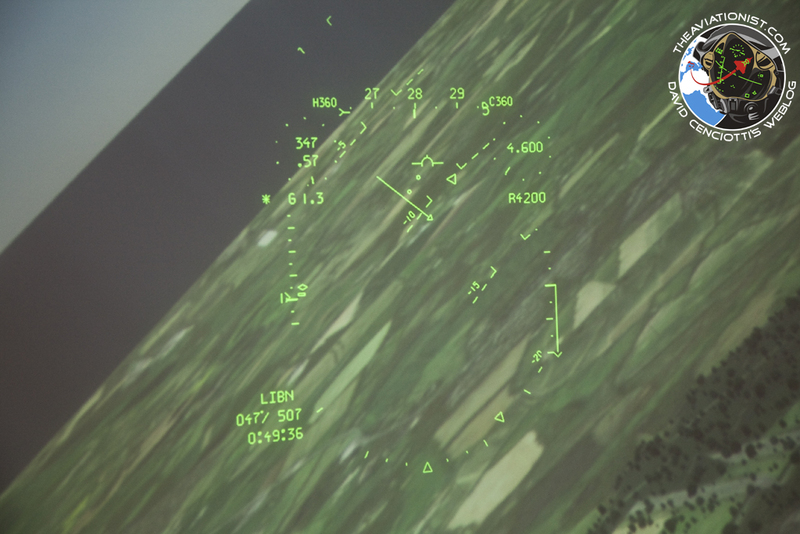 Since all the aircraft can be connected through the use of data link, simulated scenarios can involve both real planes and virtual ones. 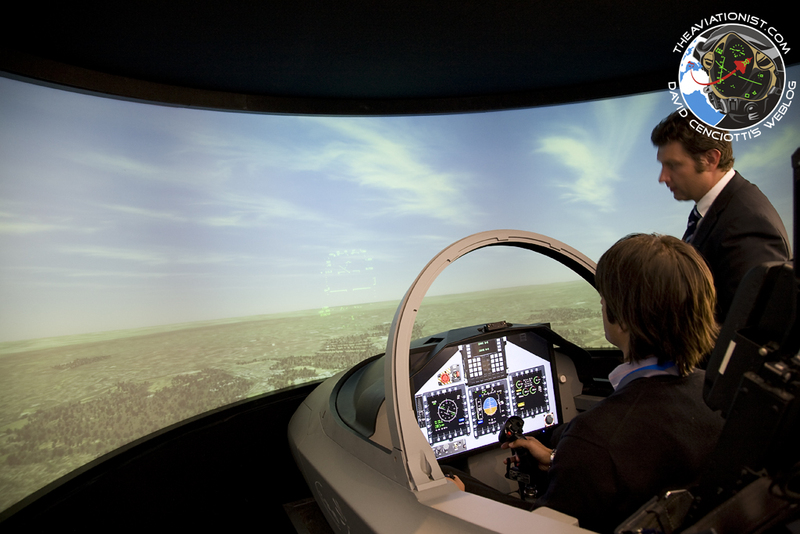 For instance, an Instructor pilot on the ground can generate simulated aerial and ground threats and targets as his student pilot is flying a sortie. After playing a bit with virtual AIM-9 and AIM-120 AMRAAM missiles I was given the opportunity to give the new Targo HMD a try. Designed by the VSI, the same firm that produces the JHMCS and F-35’s HMDS Gen. II, the Targo is a lightweight helmet built around the HGU-55P. It has a night module, designed to be fitted to the standard NVG eyepiece kit that works by overlaying the HMD symbology to that of the NVG imagery. It was my first experience with an HMD and I found it really interesting. The projected symbology was sharp and clearly visible, thus increasing situational awareness of the pilot, improving safety too. A really interesting and advanced tool for a combat trainer!